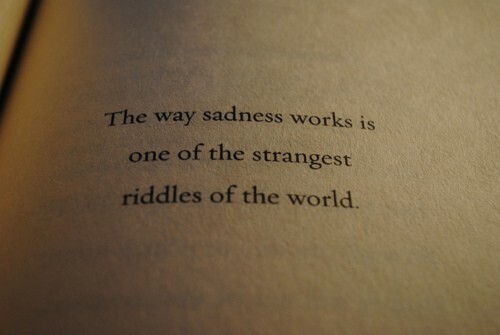 most of the times when we’re sad we don’t even really know why. and even if we do it isn’t something that we can explain or share with anyone else. sadness is the most mysterious thing we face, because it doesn’t have a name, it doesn’t have a voice. when we’re angry there is always a reason, when we’re happy even if there is no reason we don’t care. but when we’re sad for no reason, it’s like that dream where you want to scream but your voice fails you. sadness and depression are two very different things. i can’t say which is better or worse because it’s irrelevant. some people mistake the two, but they are in fact very different. not everyone who thinks they are depressed actually are. not all of us have been depressed, but i am almost certain that all of us have experienced sadness. it’s weird that something we all share is so hard to explain or understand. so hard in fact that i can’t really explain what i’m thinking right now.